Angling in on a new trend … square tables. But having attended ~50 auction fundraisers this year and consulted for dozens more, I’m noticing some ideas growing in popularity. Let’s cover the top five benefit auction trends for 2011. Whether selling cocktails or serving them, the concept is a hot commodity. Environmentally conscious auction chairs incorporate green ideas in different ways, but it most often takes one of two forms. It tends to be either a centerpiece with live plants which can be planted and enjoyed at home later, or it’s the foregoing of printed invitations and auction catalogs in favor of digital versions. Less paper = more environmentally friendly. For galas with big budgets, incorporating handheld bidding devices into the silent auction and appeal is drawing traction. Every company offering these types of systems is using a slightly different approach, but the similarity among all is that auction guests are using a device to bid on silent auction items. This eliminates the need for written bid sheets in the silent auction. With a nod to the economy, chunky gift bags filled with freebies is no longer the norm. But many auction organizers are still handing out gifts; the ‘thank you’ item is just downsized. The trend has been to give edible gifts, like cupcakes, chocolates, or even (at two benefit auctions) a bottle of champagne. Bon appétit! 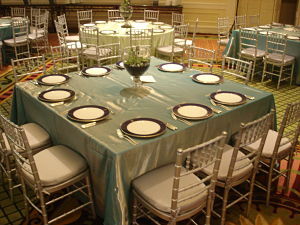 For a visual embellishment in the ballroom, square tables are intermingled with traditional circles. This trend doesn’t raise more money in the auction, but for gala chairs with a design-eye, it’s a refreshing break from tradition. And lastly, what’s the one trend that has not caught on, and I don’t really know why? I’m beginning to think it’s an administrative issue. A number of groups with whom I speak talk tell me that until their Board / attorney / school superintendent formulates a policy on Facebook and other social media, their school/nonprofit/foundation can’t do anything with those tools. Maybe Facebook will hit the benefit auction trends to watch in 2012. Because I know you want to be a hip, up-to-date auction chair, here’s an idea. This blog post is covering trends and was written at year’s end. But throughout the year, I’ve been talking about these ideas in my newsletter, Benefit Auction Ideas. So to stay up to date on new auction ideas as I find them, join my newsletter (it’s free) and get those hot concepts on a monthly basis instead. Join Benefit Auction Ideas here. I’ll see you there! Thanks for the insight and welcome to the blog, Kim. Good suggestions. I have also found that attendees really don’t want more things, ie stuff. What has been the biggest draw have been opportunities for unique experiences: Helicopter rides, shadow a cop, running a bulldozer, learn a new skill/hobby, Attend a news show and or taping, etc. I attended one benefit where the guests were given small candy bags as they were leaving and invited to scoop up a variety of candies that were displayed in beautiful jars to take home. Candies were themed to match the event. Love these, Pat — thanks for commenting! And I especially love that fact that so many of them I’ve written about on my blog. You have the BEST, most up-to-date and helpful info out there. Great work, and very cool of you to offer so much FREE advice. I’m a HUGE proponent of free and think your about as on-track as could be, building your business around this ‘free’ model. Great job! My company (I won’t mention it here as it’s not appropriate to try to get a free plug), provides FREE online auction services. We’ve got the green aspect down as well with our new mobile app that enables bidders to use their own smart phones instead of expensive, supplied devices, putting the final nail in the coffin of the traditional, inefficient pen/paper style silent auctions. I’ve got the social media aspect covered too, even if an organizations ‘rules’ won’t allow it. Imagine a scenario wherein a nonprofit loads there own auctions online and with each item they load, it’s automatically posted to their social media accounts. Against the rules you say? It works on the other side of the equation as well. Each time a bidder places their bid, it automatically posts to THEIR social media as well, inducing their friends to join the bidding frenzy (of course, they can choose to opt out of this). Did I mention this was all free to the organization? They keep 100% of the auction item proceeds for their cause. You CAN build a business around free, even a socially responsible one that puts more money back to work for worthy organizations in our shared communities. Sherry, on behalf of everyone who reads your words, THANK YOU!! I look forward to hearing more about your service. Since we help frail/disabled seniors live independently in their own homes, our auction theme this year is “There’s No Place Like Home” (Wizard of Oz). Our plan is: if anyone at a table spends more than some amount ($800? we’re still thinking about what the right amount should be) for the live auction, we’ll serve the entire table “Ruby Slippers” – a champagne/cranberry punch, with a cranberry in each glass (just cranberry juice for the teetotalers). It’s just to make the table more fun and festive and encourage those higher bids. I’ll tell you if it works…! Claire, as a native Kansan, I can’t imagine having a better theme. That said, the ornery side of me thinks your event would be much more entertaining if the teetotalers got cranberry juice and vodka. But it’s your party, and I’ll let you dance anyway you want. Good luck, and I look forward to hearing the results. I’m interested in your take on Celebrity Auctioneers. There are always exceptions, but oftentimes you are doing a disservice to your cause. One of the schools I once worked with used a celebrity auctioneer every year. He was a boisterous Dad who loved to serve as auctioneer and looked forward to it all year. He and a friend would create skits to introduce each item … and he’d tell inside jokes throughout his performance. The school didn’t want to break his heart and tell him he couldn’t be the auctioneer. They let him do it because he contributed so much time and money to their other causes throughout the year. But I was contracted to teach them how to restructure their event to raise more money in ways outside of the live auction. So yes, I understand why some use Volunteer Auctioneers. To help these groups, I offer Volunteer Auctioneer trainings. I help the auctioneer get ready for the stage. Click here to read about that training. Thanks for all the good ideas!!! Our benefit auction served strictly wine and beer for years. We decided to switch it up and spoke to some local distilleries about donating their products to the auction for signature cocktails. They did us one better: they sent a representative to mix drinks and talk up their products to our guests. We didn’t have to spare any staff members AND we got free booze! It worked for the company, too, to get their products right in the hands of their core market and the chance to talk to them. Our guests who come year after year were appreciative of the change and I like that I can offer an array of imbibing options to keep my bidders happy. I think a key to making this work is a) to go local, if possible (easier, of course, for those in metro areas) and b) to sell it to the donating company by matching your key demographic of bidders to their key demographic of customers. Win-win situations make it all the easier to solicit! I love that you opted for “outside the box” thinking, Bonnie. Great suggestions! Thank you for sharing your expertise.